Although Sharp mobile phones are a familiar sight in Japan, in the rest of the world they have become something of a "forgotten brand" with a series of unexciting phones which are nothing like the high-tech devices sold in the Japanese market. A few years ago, Sharp was pretty much the market leader when it came to technical wizardry. Sharp introduced QVGA displays with the GX20 back in 2003, 1.3 and 2.0 megapixel camera phones with the Sharp GX30 and 902, followed by the 3.2 megapixel Sharp 903 in 2005. Indeed, the specifications of the three year old Sharp 903 are still competitive today. You could say that Sharp were ahead of their time, and that perhaps was part of the problem.. the 902 and 903 were 3G trailblazers at a time when consumers were simply not interested in 3G devices. So, instead of producing high-end phones, Sharp started to come up with cheaper handsets like the GX25. These sold moderately well, but there isn't much profit in this kind of phone. The issue was compounded when Vodafone sold off its Japanese operation to SoftBank, which effectively stopped the flow of Japanese handsets into Vodafone's line-up. As a result, the Sharp SX862 is a rare thing - an advanced Sharp phone that is being sold in markets other than Japan. Admittedly, the SX862 is only available in Hong Kong, although the closely related WX-T92 is available in Taiwan and both these phones are based on the Japanese Sharp 920SH. So even if the SX862 is never officially sold outside of Hong Kong, it might still be possible for Sharp fans to get their hands on one. What makes the Sharp GX862 special is the display - this is a rotating 3.2" panel with a very impressive 854 x 480 pixel resolution. That's a smaller screen than the 3.5" on the iPhone 3G, and much smaller than the 4" display on the Nokia E90, but it is much higher resolution. This means that the Sharp SX862 can display web pages pretty much the same way that they would appear on a PC, and it can also effectively play back widescreen video. The screen uses elements from Sharp's Aquos display technology to ensure high contrast ratios and good colour reproduction.. of course, flat panel technologies are something that Sharp is very, very good at. There's a tiny 60 x 32 pixel display on the outside too. On the back of the SX862 is a 3.2 megapixel camera with autofocus, multishot capabilities and a high-intensity LED flash. SmarTone (who are selling the SX862 in Hong Kong) say that the camera quality is so good that it "will better even most 5 megapixel cameras". Video capture resolution is 640 x 480 pixels (VGA resolution), although the frame rate is not specified. The SX862 also supports video calling through a secondary camera. As you would expect, there is a multimedia player that can play back audio tracks and also VGA resolution video at 30 frames per second. Internal storage is just 50MB, but this is expandable using microSD cards up to 2GB. This is an HSDPA device capable of high-speed downloads of up to 3.6 Mbps, it also comes with USB, Bluetooth and infra-red connectivity. At its heart, this us a UMTS 2100 MHz device with GSM 900 / 1800 / 1900. Physically the SX862 is quite a large device at 111 x 50 x 18mm and 120 grams in weight. Talktime is around 3 hours 20 minutes with up to 14 days standby time. Despite the impressive specifications, this isn't really a Nokia N95 beater. The Sharp GX862 lacks GPS, WiFi or an FM radio. Also, the large display isn't touch sensitive, and because the SX862 isn't a smartphone then software options are limited. Still, this is a very impressive device. MobileBurn have a comprehensive review of the GX862, so you can judge for yourself. 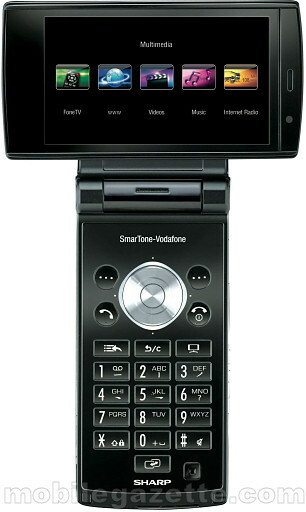 SmarTone-Vodafone are selling the SX862 for HK$5680 (approx £360 or €450) SIM Free, or HK$3280 with an 18 month contract. Because this is being sold through Vodafone's Hong Kong affiliate, it is just possible that Vodafone might choose to sell this or some other high-end Sharp devices in other markets at some time in the future. Come on Vodafone.. perhaps Europe is looking for a Japanese antidote to all the iPhone wannabees!